Acer isn't just launching the Liquid E3 at MWC 2014. It's got another, smaller sibling that reckons it can fit in just about any pocket you own. The Acer Liquid Z4 is all about being compact, affordable and as friendly to as many user demographics as possible. It wants to offer total one-handed control at a decent price, and for the most part it succeeds. At 9.7mm thick, the Z4 sits nice and cosy in the hand and actually feels quite solid despite its budget look - though it certainly doesn't feel "premium". But for €99 (about £82, $136) - and with a dual-core 1.3GHz processor and 512MB of RAM - you know you're in budget territory, so this isn't a huge criticism. In a time of growing screens, this is a phone still made very much with your pockets in mind. This makes for a bit of a cramped typing experience at the expense of a more compact device, however. So its worth bearing in mind the trade-off here. The 4-inch screen is much less agreeable in picture quality, with the 800 x 480 resolution making for a blotchy, pixellated experience. Colours look washed out, particularly when you're using it in a well-lit room. The 5MP rear camera camera with flash isn't bad for a low-budget phone like this. We had a go at taking some pictures with Acer's camera app and the quality seemed reasonable, although it was hard to appreciate it on that screen. Also on the rear is the same Acer Rapid button found on the Liquid E3. This can be assigned to open any app with a short press, while a longer press will start the camera app. Both of these, however, can be turned off if you so wish. It follows in the footsteps of the LG G2, and its usefulness will most likely depend on how you hold your phone. Having a shortcut button on the front probably still makes more sense, but that's just my opinion. 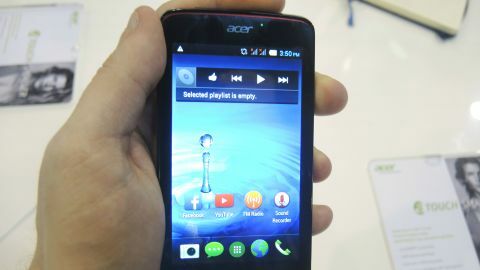 The phone comes running Android 4.2.2 (which had enough zip when we used it) along with Acer's Liquid UI on top, the biggest change being Quick Modes. As with the E3, this allows you to tailor the Android experience to who's using the phone. If it's granddad, you can make icons bigger and the more useful feature most easily accessible. Or for young children, you can restrict the phone's functions to basic calling and texting, if you so wish. It's not going to win any spec battles, but the Z4 could prove to be pretty popular with its low price point. And with screen sizes getting bigger and bigger, it's interesting to see Acer putting out something that goes against the tide.